"Denis McQuail's Mass Communication Theory is not just a seminal text in the study of media and society - it is a benchmark for understanding and appreciating the long and winding road people and their media have taken to get us here." "This is a unique work tested by time and generations of students around the world - North, South, East and West." 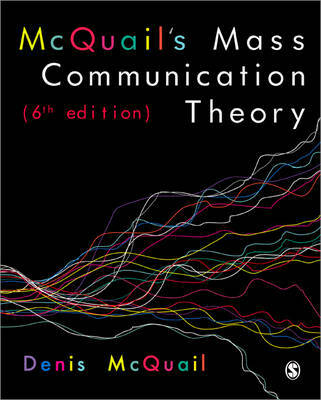 "McQuail's Mass Communication Theory continues to be the clearest and best introduction to this sprawling field." With over 125,000 copies sold, McQuail's Mass Communication Theory has been the benchmark for studying media and communication for more than 25 years. It remains the most authoritative and comprehensive introduction to the field and offers unmatched coverage of the research literature. It covers everything a student needs to know of the diverse forms of mass communication today, including television, radio, newspapers, film, music, the internet and other forms of new media. Denis McQuail shows that more than ever, theories of mass communication matter for the broader understanding of society and culture. Explorations of new media, globalization, work, economy, governance, policy, media audiences and effectsNew boxed case studies on key research publications, to familiarize students with the critical research texts in the fieldDefinitions, examples, and illustrations throughout to bring abstract concepts to life. McQuail's Mass Communication Theory is the indispensable resource no student of media and communication studies can afford to be without.